Thomas Paine was born in England to a Quaker father and an Anglican of the social caste system. He was a highly intelligent boy who was largely self-taught, having been limited by his poverty and social standing. Educated until he was thirteen, he then apprenticed in his father's corset shop until he went to sea at nineteen. 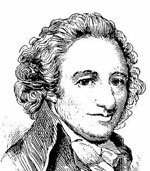 Once back in England, Paine worked variously as a tobacconist and grocer, a teacher, and an exciseman who taxed goods for the government and organized other excisemen to demand a raise in salary from Parliament. At thirty-five, he came to Philadelphia with letters of introduction from Benjamin Franklin; there he supported himself as a journalist, speaking out against slavery and publishing Common Sense (1776), a pamphlet in which he encouraged Americans to separate from Britain. During the Revolution, he published a series of sixteen pamphlets called Crisis, the first of which ("These are the times that try men's souls") was read to and inspired Washington's troops. Although Paine was rewarded for his stirring writing with several political appointments, he misused his privileges and ended up losing his appointments. Returning to England in 1787, he composed Rights of Man (1791-1792), a tract against hereditary monarchy, was consequently accused of treason, and fled to France, where he was imprisoned for speaking out against the execution of Louis XVI. Rescued by American ambassador James Monroe, Paine returned to New York, where he lived out his life in poverty.